Creates a new standard item model. 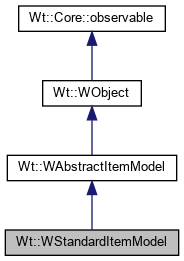 The standard item model supports all features of WAbstractItemModel, and can thus be used to represent tables, trees and tree tables. The data itself are organized in WStandardItem objects. There is one invisible root object (invisibleRootItem()) that holds the toplevel data. Most methods in this class that access or manipulate data internally operate on this root item. If you want to use the model as a table, then you can use WStandardItemModel(int, int, WObject *) to set the initial table size, and use the item() and setItem() methods to set data. You can change the geometry by inserting rows (insertRow()) or columns (insertColumn()) or removing rows (removeRow()) or columns (removeColumn()). If you want to use the model as a tree (or tree table), then you can use the default constructor to start with an empty tree, and use the WStandardItem API on invisibleRootItem() to manipulate the tree root. When you are building a tree, the column count at each node is 1. When you are building a tree table, you can add additional columns of data for each internal node. Only the items in the first column have children that result in a hierarchical tree structure. When using the model with a view class, you can use the itemFromIndex() and indexFromItem() models to translate between model indexes (that are used by the view class) and standard items. Creates a new standard item model with an initial geometry. Creates a standard item model with a geometry of rows x columns. All items are set to 0. Adds a single column of top level items. Appends a single column of top level items. If necessary, the row count is increased. Adds a single row of top level items. Appends a single row of top level items. If necessary, the column count is increased. Appends a single row containing a single item. Appends a single toplevel row, with a single item. Erases all data in the model. After clearing the model, rowCount() and columnCount() are 0. Returns the model index for a particular item. If the item is the invisibleRootItem(), then an invalid index is returned. Inserts a single column of top level items. Inserts a single column of top level items at column column. If necessary, the row count is increased. Inserts a single row of top level items. Inserts a single row of top level items at row row. If necessary, the column count is increased. Inserts a single row containing a single item. Inserts a single toplevel row, with a single item. Returns the invisible root item. The invisible root item is a special item that is not rendered itself, but holds the top level data. Returns the top level at at (row, column). This may be 0 if no item was set previously at that position, or if the indicated position is out of bounds. Signal emitted when an item is changed. This signal is emitted whenever data for an item has changed. The item that has changed is passed as the first parameter. Returns the standard item that corresponds to a model index. If the index is an invalid index, then the invisibleRootItem() is returned. By default, no flags are set. Sets the top level at at (row, column). If necessary, the number of rows or columns is increased. If an item was previously set for that position, it is deleted first. Set the item that is cloned when an item needs to be created because the model is manipulated through its WAbstractItemModel API. For example, this may be needed when a view sets data at a position for which no item was previously set and thus created. The new item is created based on this prototype by using WStandardItem::clone(). The default prototype is WStandardItem(). Set the role used to sort the model. The default role is ItemDataRole::Display. Returns the role used to sort the model. Takes a column out of the model. Removes a column from the model, and returns the items that it contained. Takes an item out of the model. Removes an item from the model, and returns it. Takes a row out of the model. Removes a row from the model, and returns the items that it contained.